By Tibor Pal - PhD candidate. What is the disposable income definition? The disposable income formula. How to calculate disposable income? 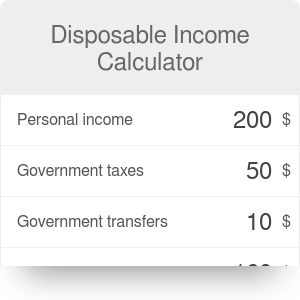 Disposable income calculator tell you how much of your income you have left after familial (or individual) obligations to the government. If you read further you can learn about what is disposable income, get familiar with the disposable income formula and can read about the role of disposable personal income (also known as disposable earnings) in macroeconomics. Disposable personal income is an economic term that refers to the part of income which is available for households or non-corporate businesses for spending or saving after meeting all their tax obligations and receiving government transfers. Transactions to the government include all personal taxes and also some particular non-tax payments such as traffic tickets. Transfers received from the government cover all transactions without expecting a good or service in return. It can be any welfare, financial aid (for example unemployment benefits) or social security payments made from the government. Disposable personal income = personal income - government taxes + government transfers. The largest factor that contributes to economic output (or to the Gross Domestic Product - GDP) is the personal consumption (in the United States around 70 percent of the GDP comes from consumption). Since families essentially base their consumer spending decisions on their current available income, changes in disposable income can have a considerable impact on the state of the economy and thus on GDP growth. To see how governments can influence the level of consumption through disposable earnings, and thus the economic performance, let's consider a real-world example. The 2008 Financial Crisis and the ensuing Great Recession lead to a mostly downward trend in the level of employment, leading to a decrease in the total income of the United States and other industrialized nations. As a result, the disposable income of families shrunk, leading to further lowered economic output through curtailed consumer spending. There are various instruments in the policy repertoire to ameliorate any adverse force in a depressed economy. In the following section, only those policies which have a rather direct effect on the disposable income will be outlined. By reducing the tax burden on a families' budget, the government can directly increase the disposable income through taxing policy. The United States did this in the Economic Stimulus Act of 2008, giving a 600 dollars tax rebate to low and middle-income Americans to help stimulate their spendings. The American Recovery and Reinvestment Act of 2009 (Recovery Act) also consisted of 237 billion dollars in tax incentives for individuals but also 1.7 billion dollars were devoted to sales tax deductions from car purchases. By supporting those individuals who are most affected by the Financial Crisis (for example through unemployment benefits), the government not only can helped families meet their basic needs but also contributed to a faster economic recovery by improving the total level of disposable earnings. In the US, the Recovery Act included an 82.2 billion dollars aid to low-income workers, unemployed and retirees. As money flows into the economy in the form of government purchases or investments, it is a form of income (for example through creating new jobs), thus the total income of a nation increases, which can in turn boost disposable income. The Recovery Act covered a near 400 billion dollars of government investment that were spent mainly on health care, education, and infrastructure. Inflation may also have a considerable effect on the real value of your available income. If you are curious how, check out our salary inflation calculator to better educate yourself. Tibor Pal - PhD candidate. Disposable Income Calculator can be embedded on your website to enrich the content you wrote and make it easier for your visitors to understand your message.